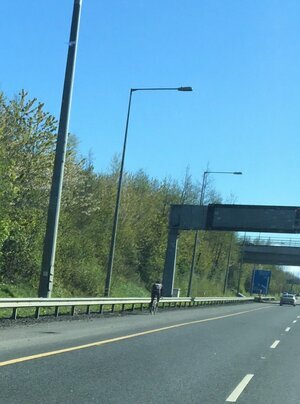 A lovely day for a Sunday cycle… on the M1 motorway. Cycling on a motorway is not legal. Posted in Misc and tagged Cycling, Motorway at 9:05 am on April 30, 2018 by Chompsky. An invalid carriage! I’ve never heard that one before. They were nifty little three-wheeler powder-blue things with fiberglass bodies which had just about enough room and oomph to ferry one person and their shopping. They did have an unfortunate tendency to burst into flames, which was especially troublesome given that the occupants were always impaired in their ability to get clear of the burning plastic. I believe they were all withdrawn years ago. Isn’t it another term for “Mobility Scooter”? This used to infuriate me. Then one time I was heading onto the M1 from the Swords entry and got diverted by the Gardaí. I found out later it was one of these guys came to an unfortunate end on the slipway. Sometimes the law is there for your protection, and if you come a cropper you’ve only yourself for your family to blame. also quite apart from the suitability of the surface would you not be vulnerable to HGVs passing at speed? In my car I often feel a pull to the side as these guys pass .. I know a lad who does this all the time. He doesn’t care. He knows he’s not supposed to. But still. 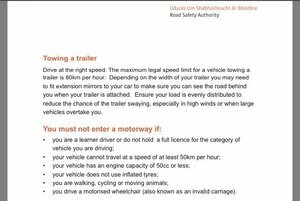 Whatever about the standard of driving in general in Ireland, the crazy stuff that goes on on at speed on our Motorways is bonkers with significantly reduced reaction times. The crazy part of this is how does the cyclist get past a motorway exit? I used to cycle to Leixlip from Dublin. A lot of cyclists would cycle on the motorway until the first exit, rather than going along the back roads (which were perfectly fine to be honest). But I suppose they didn’t have to negotiate any motorway exit- could be the case here too. Being the curmudgeonly character than I am, I decided to fact-check this against google maps. It’s “M4” as far as Lucan apparently. From Dublin to Leixlip is N4 not M4. M4 starts after Leixlip/Celbridge exit (Junction 5). Looking again, I humbly submit to your correction. You’re right Boj, it’s the “Leixlip West/ Celbridge” exit that I was referring to. Plus a bunch of cars park on the motorway bridge over the liffey on sunny days. Parking on a motorway is illegal of course. the same way they go past a dual-carriageway exit. I’m not defending this guy but from a safety point of view it’s not much different the large groups of cyclists who use the N11 or the N7 – car hits you at 100km/h or 120km/h the result is going to be the same. Personally I hate cycling on dual carriageways but it’s impossible to get from A to B in some places without using them for at least short distances. And no fupping hi viz!!! …or knee/elbow pads…!!! And probably ‘eye of the tiger’ pumping through earphones. 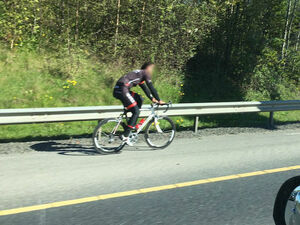 How pathetic – “Ive seen a cyclist on the motorway who should be there so Im going to report him to the internet”!!! On the same journey, I bet same dullard saw 10 incidents of motorists and bad driving. Without justifying the cyclists action, at least reckless Cyclists never endanger any one elses lives when getting from A to B. The M1 is a great stretch for people driving half on half off the hard shoulder at 60kmph while talking on the phone, as if that’s somehow better than just driving normally while on the phone. Seen that one a good few times in my rep days. No high vis either! He’s asking to be run over! What are you talking about? People have been calling for more cycle lanes for a long time. The rest of your comment is just bonkers. He’s not cycling animals, he’s cycling a bike. I read this as perfectly legal. I also note, that without a timestamp on the photos it appears he has overtaken, with ease, the car taking the photos. This man deserves a medal.